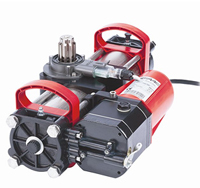 24VDC Hydraulic Underground operator for residential swing-leaf gates with single-leaf max. length of 13ft and single-leaf max. weight of 1,300lbs. The model S800H includes a hydraulic manual release and built-in positive stops. FAAC 770 Basic Single Gate Operator Kit - Includes 24VDC Operator, Support Box, 425D Control Panel, 10x12 in. Enclosure, Transformer and Batteries (2) The FAAC 770 Compact automation system for swing gates is a geared motor. It is designed for underground installation and therefore does not alter the appearance of the leaf. The operators are controlled by an electronic control unit mounted in an enclosure which assures adequate protection against atmospheric agents.